Inflation is a corrosive force that gradually – and sometimes rapidly – eats away at the nominal value of savings and investments. It is perhaps the biggest threat looming on the horizon for millions of retirees who have been steered into assets marketed as “conservative” – such as dollar-denominated money market accounts, bonds, and annuities. According to the Aegon Retirement Readiness Survey 2018, an alarmingly large proportion of the population doesn’t understand basic financial concepts such as inflation. That may be obvious to you. But it’s not to everyone. Among U.S. respondents, only 55% answered the inflation question correctly! A score of “55” is equivalent to an “F” – as a nation, we are outright failing to grasp the basic concept of how inflation negatively affects savings. 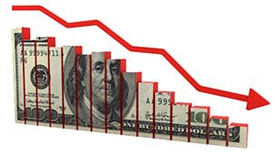 Widespread public ignorance about inflation works, perversely, to the advantage of governments, central banks, commercial banks, and peddlers of fee-laden, inflation-lagging financial products such as fixed annuities. Investors who are savvy about the inflation threat know that conventional annuities, bonds, and savings accounts are all vulnerable to losing value in real terms. But those seeking protection from inflation can still run into trouble by venturing into flawed "inflation hedges." Treasury Inflation Protected Securities (TIPS). Though they could fare relatively better than conventional fixed-rate bonds as inflation rises, TIPS bonds are flawed. They are pegged to a flawed Consumer Price Index gauge which undeniably understates real-world consumer prices. Foreign currencies. Assets denominated in foreign currencies may benefit from a decline in the U.S. dollar on foreign exchange markets. But foreign markets won’t necessarily keep up with inflation. There are no truly sound national currencies out there, so the fact that one is gaining against another over any given period doesn’t mean it’s not also depreciating in real terms. Cryptocurrencies. Some Bitcoin bugs tout the cryptocurrency as “digital gold.” They are mistaken, however. Despite their advantages, Bitcoin, Bitcoin Cash, Ethereum and most other cryptos are purely digital assets with no tangible backing. Moreover, there is no limit on the number of competing digital currencies that can be created. So while cryptocurrencies may have explosive upside potential and may well be more reliable than national fiat currencies, they also carry huge downside risk – irrespective of the inflation rate. Commodities. In theory, owning a basket of commodities is a good hedge against inflation. In practice, you probably don’t want to store barrels of oil and bushels of wheat in your basement. That means you have to own speculative derivative instruments that often fail horribly at keeping up with the long-term price movements of the underlying commodities. Commodity futures, ETFs, and the like are suitable only for short-term speculation, not long-term inflation protection. Gold and silver mining stocks. Mining companies stand to benefit from rising metal prices. But they are also vulnerable to rising energy, labor costs, and political risks and can become unstable during a financial crisis. As a consequence, the mining sector should be viewed more of a speculation than an inflation hedge – no substitute for physical precious metals. Numismatic coins. Investors who grasp the need to hold some physical precious metals as part of an inflation protection strategy can still make a big mistake if they buy pricey and illiquid numismatic coins. The large collectible premium attached to numismatic coins is unlikely to rise with inflation or match the gains on spot metal prices. And to be sure, the high-pressure advertisers of so-called “rare” coins have ripped off countless numbers of hapless investors. Over a period of decades and even centuries, the purchasing power of gold and silver tends to remain relatively constant. Gold is a timeless, immutable monetary asset, still widely held by central banks. For these reasons, gold and its junior partner silver are an indispensable long-term inflation hedge. The catch is that precious metals markets don’t always track inflation well in the near term. They can suffer large cyclical declines over a period when other asset classes may be gaining. Of course, they can also post huge gains when conventional markets are falling – that’s what makes them essential for proper portfolio diversification. 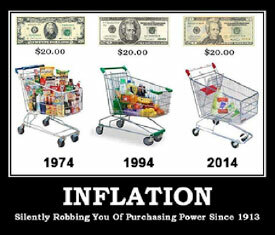 The reality is, no single asset protects investors against inflation perfectly. You should be diversified into an array of assets, including blue-chip stocks that have a well-established history of raising their dividend distributions, foreign stocks, real estate, physical precious metals, and perhaps other tangible assets. When the purchasing power of the currency takes a dive, that’s when hard assets will shine.